Pony Up is a hip new bar on Blake Street in Denver that brings a posh yet unpretentious option to the Ballpark neighborhood near Coors Field. And, it’s built for both comfort and speed. Co-owners Angela Neri and Sheamus Feeley have an impressive grasp of what’s trending in the food and beverage industries, and they stay involved in cooking, managing and serving. They have launched multiple past projects in Colorado and across the country. However, this is the first establishment under the Sheamus Feeley Hospitality Group umbrella, where they combine their knowledge, appreciation and experience. Pony Up is contemporary and chic while still down-to-earth, with eye-catching cocktails, a French dip-focused menu and good times around the shuffleboard tables. And it really is all about the bar, which Neri rightfully calls “the showcase piece.” The elongated, sleek stick winds down the deep, inset building, generously peppered with stools bathed in halo lighting from the glowing orb fixtures suspended above. A well-lit, impressively organized back bar secures steps and handles for the bartenders to climb up and down efficiently, accessing a broad collection of local and exotic craft spirits. The drinks pay homage to tried-and-true libations from the past, while also incorporating delicate twists, such as the Brown Butter Old Fashioned with added sweet and smoky notes, or a Paloma made with Peychaud’s Bitters for an unexpected nuance. Pony Up appeals directly to neighborhood folks with great deals on $10 beer-and-shot specials that include: W.L. Weller Bourbon and a Stone IPA, Mezcal Unión and a Tecate or Fernet Branca (the bartender’s handshake) and a Montucky Cold Snack. Tropical drinks with colorful, oversized garnishes and special “Tiki Nights” also invite a sense of whimsy and mod onto the menu and the calendar, vastly distinguishing them from the casual beer bars nearby. 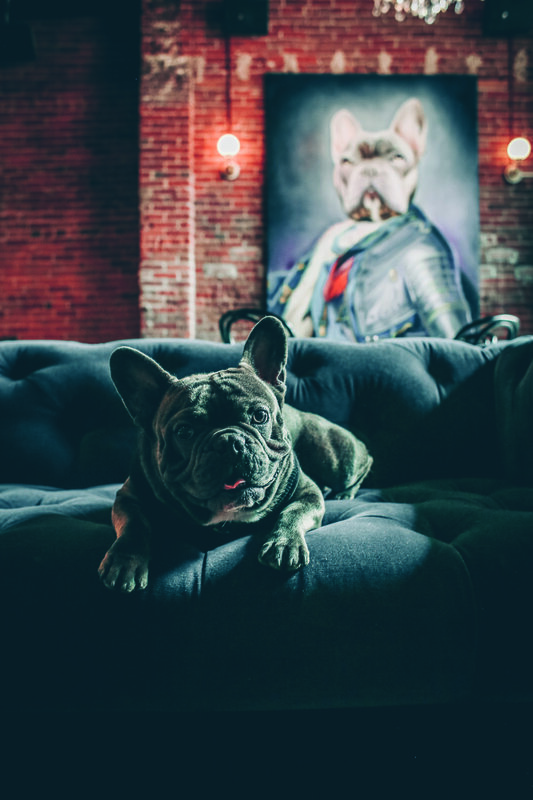 Other escapes include an oversized painting of Neri’s French bulldog, Louis, dressed up as King Louis XIV by Denver muralist Patrick Kane McGregor; sought-after Japanese fried chicken that Feeley says “every chef in town comes in and orders;” regional shoutouts on the classic cocktail menu; and playful French dip sandwiches such as The Frenchie, The Saigon and The Alameda Street Classic. “It all flows together,” says Neri. Feeley said he chose to highlight the “easy-to-eat” juicy handhelds because they evoke trips he would take with his dad in Southern California to eat at Phillipe The Original, which claims to have invented the now-famous sandwiches more than a century ago. Although a sammy-based menu sounds somewhat simplistic, the orchestration of slow-cooked proteins, accompanied by an assortment of complimentary broths and freshly baked buns from Hinman’s Bakery in Denver, fortifies a satiating, unexpected and contemplative presentation of bar food. Neri and Feeley urge patrons to find a saddle stool below the alluring, bright text to snap photos, relive pieces of history and new places through thoughtful cocktails. He hopes that guests can simply “capture the moment” and unwind within the inviting and eclectic retreat.